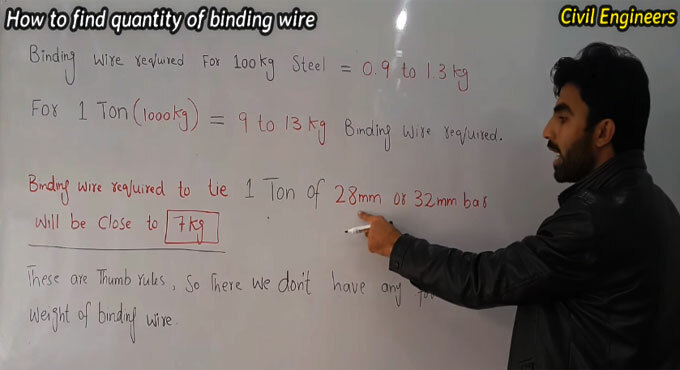 In this video tutorial, Sami Ullah, the renowned civil engineer, has taught some crucial formulas which are essential to determine the weight of binding wire for steel (reinforcement works). The tutorial is very useful for civil engineering students. Except for stirrups, binding wires are also useful for retaining the rebars throughout the construction. Binding wires are effective for fastening rebars at the joints to clasp the structure together. Binding wire is also known as annealed wire and is formed with mild steel. The main and distributional reinforcement rebars are detained together with annealed wire. Binding wires are built up with the method of annealing which add flexibility, softness and required strength in them. The diameters vary from 0.61 mm to 1.22 mm. 3: Toward one Ton steel work ( 1000 kg) if the diameter of steel remains 28mm to 32mm so that binding of steel with each other can be done with just 7kg of binding wire. So there are the important for find the weight of binding wire for RCC (steel) works which are exact weight for above steel weight. These are the common thumb rules for determining the quantity of binding wire.